February 11, 2014. Posted in Gujarat. Chai in Gujarat is often a family affair. The western state’s first family in terms of tea is indisputably the Desais, owners of the Wagh Bakri Tea Group, which has become the third largest packaged tea company in India after Hindustan Unilever and Tata. And of course, Gujarat’s chief minister and candidate for prime minister Narendra Modi worked at his father’s tea stand during his childhood, a story that has been extensively covered by the Indian media. But more often than in boardrooms or politics, the business of tea is carried out by families in the streets of Ahmedabad, Gujarat’s largest city. For the Rajputs, chai is a family business. 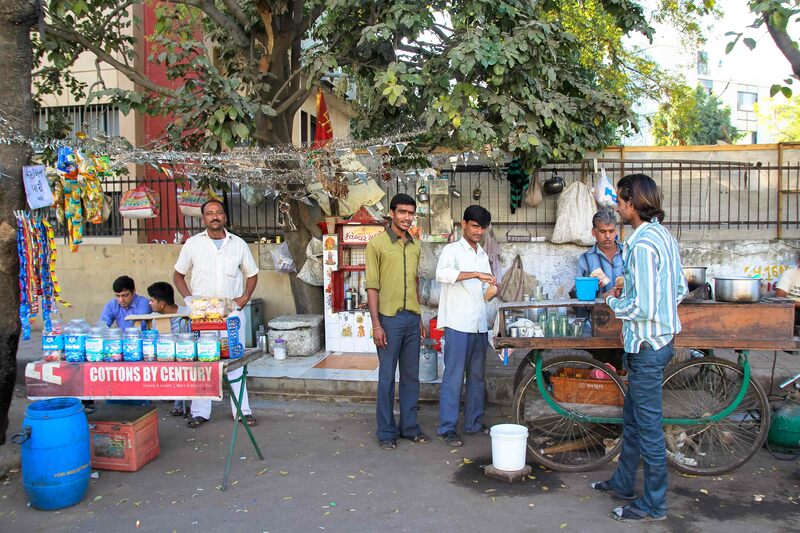 Pictured left to right: Manu Singh, Ganesh, Devraj and Bharat Bhai serve customers near Ahmedabad’s Law Garden. The men of the Rajput family are one such example, running a popular chai stand near Ahmedabad’s Law Garden. The Rajputs came to Ahmedabad nine years ago from a village near Rajsamand in Rajasthan’s Udaipur district. Whereas many chai wallahs begin their careers by washing glasses and serving customers for other chai wallahs until they save enough money to open their own stands, the Rajputs were able to pool their savings and open their own business from the get go. Tags: Ahmedabad, Gujarat, Hindustan Unilever, Narendra Modi, Tata, Wagh Bakri.